Wow guys, I have some super exciting things on the blog today and for the next couple posts. 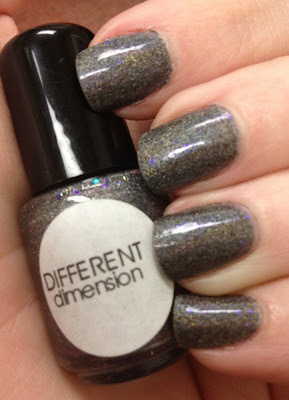 I have had the honor of receiving my first polishes to review!!!! 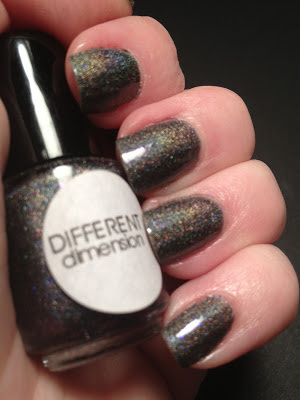 The wonderful Missi from DIFFERENTdimension sent me her Set It Free collection for review. The set consists of three holographic polishes that have an amazing color shift in them, the one I am featuring today has glitter in it too! I had such a hard time choosing which one to wear first, they are all that pretty. 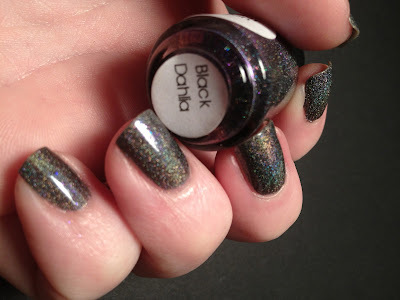 But one had to be first and I chose Black Dahlia. 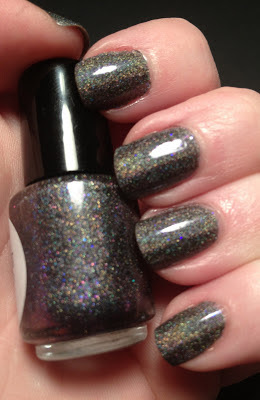 This is Missi's description of it: "Black Dahlia is a black leaning greyish purple scattered holographic polish with hints of different colors reflected in the light, it also has micro iridescent glitters in it. It looks amazing by itself or layered over other colors." The pictures below are two coats of Black Dahlia over Orly bonder topped with one coat of HK Girl. I had zero issues with application, it went on with no streaking and was great to work with. I had different lighting conditions for these in order to (hopefully) show it would look in real life. 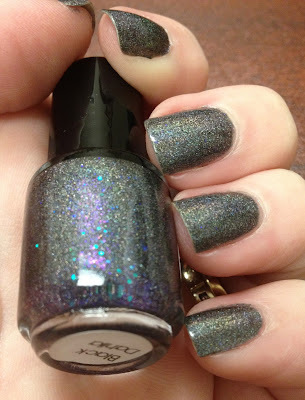 I will say that this polish has an amazing purple shift to it that was very hard to capture on camera. I honestly could not stop staring at my nails while I was wearing this. This is my favorite shot of this! Great bottle shot that shows the flash! Find her on Facebook here: Like!